Two people have been killed and another two injured in a crash in Cambridgeshire at the weekend. 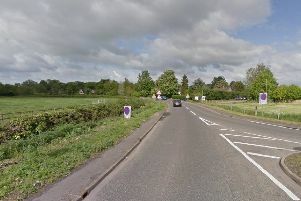 Police were called at about 6.30pm on Saturday (September 10) to a crash between a silver Renault Clio and a blue Volkswagen Polo on the A1198 at Bassingbourn. Sadly the driver of the Renault, Claire Bakhtiar, 38, of Mill Road Mews in Salisbury, Wiltshire, died at the scene. A nine-year-old boy, Lawrence Carroll, of Tamworth Road in Hertford, Hertfordshire, who was a rear-seat passenger in the Volkswagen, suffered serious injuries and later died in Addenbrooke’s Hospital yesterday morning (Sunday). The driver of the Volkswagen, a woman in her 40s, suffered serious but not life-threatening injuries and the front-seat passenger, a 15-year-old boy, suffered minor injuries. They were both taken to Addenbrooke’s Hospital in Cambridge where they remain. Anyone with information is asked to call the road policing unit on 101, or Crimestoppers, anonymously, on 0800 555 111.